This series was inspired by the Cooktown Orchid (Dendrobium Bigibbum) which growns in the far north of the State and has been the Queensland Floral Emblem since 1959. The series is either slipcast from plaster molds or slab rolled white stoneware impressed from latex molds for which I made the original pieces. 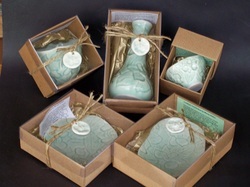 The pale green glaze is high fired which makes the pieces totally functional. Photo by artist.